The students classify words from a list as a person, place, or thing. Some of the words on the list are verbs but those could be edited out if it's too confusing for younger children. The present downloadable teaching material is a great resource for elementary school students at Elementary (A1) level. 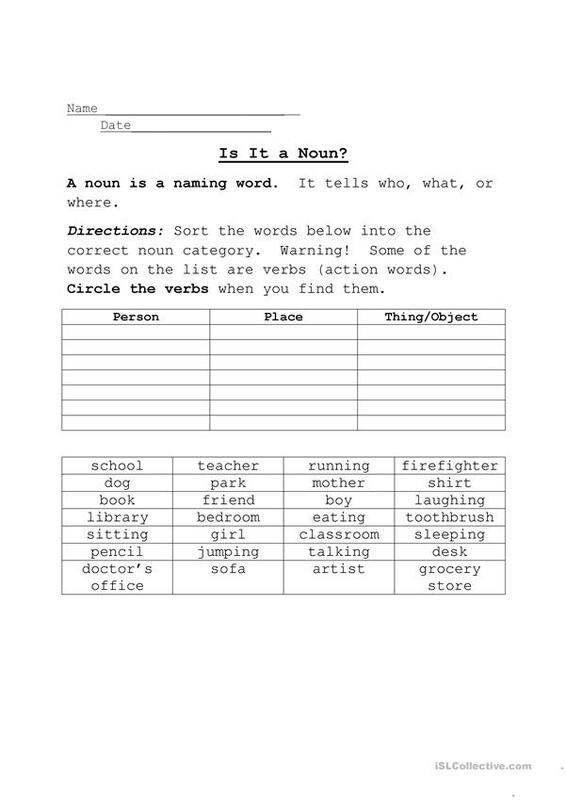 It is aimed at consolidating Nouns in English, and is excellent for working on your students' Writing skills. scaredycat8 is from/lives in United States and has been a member of iSLCollective since 2012-09-06 16:16:40. scaredycat8 last logged in on 2012-11-07 14:51:40, and has shared 3 resources on iSLCollective so far.